“Organization of Ukrainian Nationalists” battalion militants attacked several buildings in Kiev, according to Ukrainian media. The office of Ukrainian oligarch Renat Akhmetov, one of the participants of the war between Ukrainian oligarchs, was the first target of radicals. The militants threw stones at the building, breaking several windows. 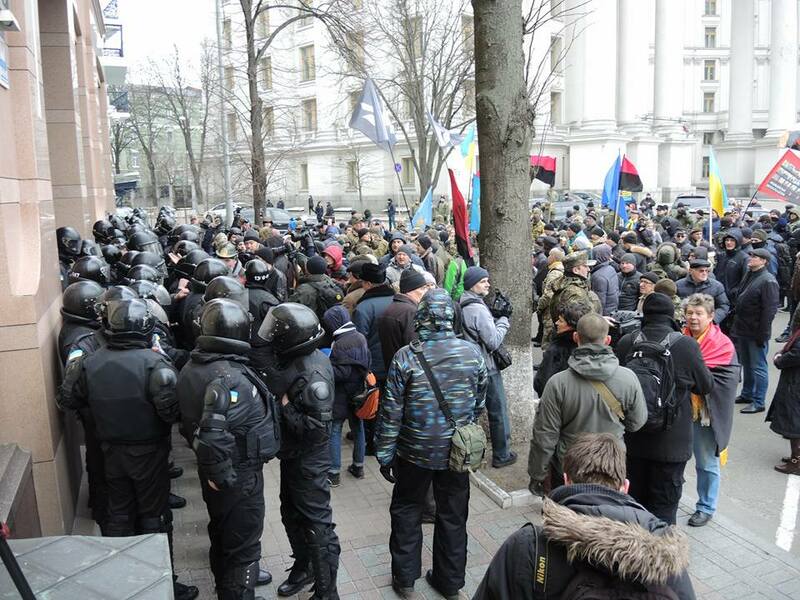 Earlier the radicals have protested before the Presidential Administration building. Additionally, the militants of OUN broke into Alpha-bank office “because it’s Russian,” Ukrainian journalist Aleksandr Rudomanov reported on his Facebook page. Also, according to Ukrainian media, radicals threw stones at the building of the Ukrainian offshoot of Russian bank Sberbank. They continued to do so even after the building was surrounded by the police. Nationalists claim that they are against the fact that the bank operated in Ukraine. The situation near Sberbank has currently stabilized. Rallies are underway in Kiev on February 20 due to the anniversary of the maidan coup. This entry was posted in News from Ukraine and tagged Kiev, Ukraine. Bookmark the permalink.